In part three we see a brand new segment not included in the original DVD release of Arnold at the 1972 Southern Hemisphere Mr. Universe. Includes footage not included in the original release of this world-famous DVD. In part three we see another brand new segment not included in the original DVD release. It shows Arnold guest posing at the 1972 Southern Hemisphere Mr. Universe in Australia. His first visit to this country. 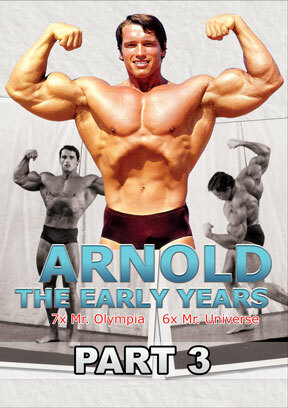 GMV’s award winning documentary on Arnold’s early career in bodybuilding. Read Arnold Schwarzenegger’s early contest history 1963 – 1966, article also includes competitive weightlifting and powerlifting history 1963 – 1968. From Dr. David New.